Any experienced vegetable gardener will tell you it is very difficult to limit the space you use for growing vegetables. Every year, there are new varieties that look fascinating, but the varieties we have grown in past years have often been terrific. What's happening to me is a little different. The size of my vegetable patch is now more controlled by how much stamina I have left. At 70 years old, I've even had to consider dropping my hopes of joining the NBA. Actually, it is not the stamina so much as making sure when you get down on your hands and knees to pull weeds or plant seedlings, you have made allowance for being able to get up again. There are times that it's good no one is standing around watching me. Seeing this old codger moving around on his hands and knees looking for a place to leverage his sorry bones enough to get back up to a standing position is not a pretty sight. There are two issues here. Not only is it hard to get back up from a kneeling position these days, the old knees don't like to be leaned on for too long; then they complain. I'm looking at what is hot these days in garden kneeling and sitting devices. And soon I'll check out my options for knee pads. There are lots of kneeling pads available that are inexpensive, but my need is a kneeling device that has steel arm supports on both sides of the kneeling area. I need those to pull myself back up on my feet. Without them I'm crawling around again. When I checked out Amazon.com, they had more than 20 products to help with the knees. 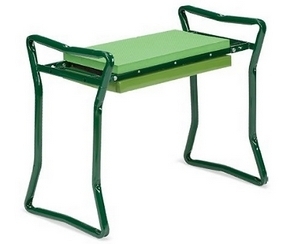 The one I have ordered is the Yard Butler Garden Kneeler & Seat,www.amazon.com, for $39.22. Many of the kneelers are designed so when set on the ground, a padded board rests on legs that are only a few inches off the ground -- that is when you use it for kneeling. Then by turning the device upside down, you have a seat resting 12 to 15 inches off the ground -- low enough to still reach down to pull weeds and pick fruit. The "Yard Butler" has the same design concept, but unlike the others it can be folded up for handy storage. Now knowing I will be able to get off my hands and knees this spring, I can get back to the serious work of deciding which variety of tomatoes I will plant in a few months. Later in the month, I'll give you my findings on knee pads. Here is a good kneeler.